(CNN) -- Ousted Honduran President Jose Manuel Zelaya returned Monday to the capital city of Honduras, where he said he is planning to meet with his critics to arrange for his return to power. 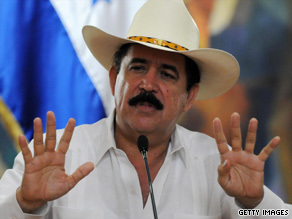 Zelaya was seized by the Honduran military in his pajamas and sent into exile on June 28. In the capital of Tegucigalpa, the interim government ordered a curfew from 4 p.m. Monday until 6 p.m. Tuesday, said journalist Erin Sandoval. "I have never seen the sky so blue and beautiful," he told CNN en Español in a telephone call from the Brazilian Embassy in Tegucigalpa. It was Zelaya's first view of the city since June 28, when he was awakened by soldiers who then put him, still in his pajamas, on a plane out of the country. "I have returned so that dialogue can carry on in my own land and in my own city," he said. "I hope that in the next few hours we'll be able to communicate with the coup plotters." "For the moment, thanks to [Brazilian] President [Luiz Inacio] Lula, ... we have protection here." Zelaya called on the armed forces to allow the matter to be resolved through dialogue. "They're members of the pueblo," he said. "We look for immediate dialogue. ... Our position is peaceful, it always has been." He said thousands of people had taken to the streets of the city in support of his return. Zelaya said he spent Sunday night in Guatemala, and that his trip to Tegucigalpa took more than 15 hours. "There was a lot of security and roadblocks," he said. "There is a lot of persecution, a lot of fear in our country." At the United Nations, U.S. Secretary of State Hillary Clinton and Costa Rican President Oscar Arias expressed hope that Zelaya's return could break the impasse with the Micheletti government and restore the ousted leader to office. "Now that President Zelaya is back it would be opportune to restore him to his position under appropriate circumstances -- get on with the election that is currently scheduled for November, have a peaceful transition of presidential authority and get Honduras back to constitutional and democratic order," Clinton said. And Arias told reporters that Zeyala's return was "the best opportunity" to move forward with the San Jose Accord he negotiated. "It's all we have on the table," he said. "There is no B plan." In a written statement, the secretary general of the Organization for American States, Jose Miguel Insulza, confirmed Zelaya's presence in the embassy and called on "the actors involved in this process" to be calm. He said the de facto government "should make themselves responsible for the security of President Zelaya and of the Brazilian Embassy." Zelaya's return comes as the United States has stepped up its call for the current Honduran government run by de facto leader Roberto Micheletti to restore Zelaya to power. Earlier this month, the United States revoked the visas of Micheletti, 14 supreme court judges and others. The United States also said it was terminating all non-humanitarian aid to Honduras in a bid to pressure the interim government to end the political turmoil and accept the terms of the San Jose Accord, which was brokered by Costa Rican President Oscar Arias. The accord calls for Zelaya's return to power. The political crisis stemmed from Zelaya's plan to hold a referendum that could have changed the constitution and allowed longer term limits. The country's congress had outlawed the vote and the supreme court had ruled it illegal. Micheletti and his supporters say that Zelaya's removal was a constitutional transfer of power and not a coup. The United Nations has condemned Zelaya's ouster and does not recognize Micheletti's government. While the United States has called Zelaya's ouster a coup, it has not formally designated it a "military coup," which, under U.S. law, would have triggered a cutoff of all non-humanitarian aid. Senior State Department officials said the Obama administration was reluctant to make the formal designation in order to preserve its flexibility for a diplomatic solution. A presidential campaign in Honduras kicked off this month. However, the United States said it would not support the outcome of the elections unless Zelaya was restored to power.